November 2012 – on my way: make it someday. 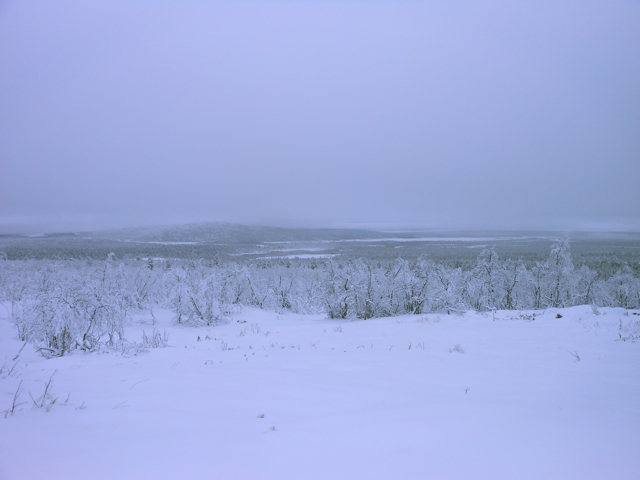 At no point during my trip to Kiruna did I figure out how to take pictures that really captured the light. Saying that it was dark in Kiruna would be sort of true, but sort of missing the point: when there’s snow, the seven hours of each day that see the sun above the horizon stretch much further, and they often turn pink. Instead of being lit by the sun, the land is lit by its snow. And on the city’s longer trail systems, that is what you are skiing through: an open landscape, to a large extent, and vistas with miles and miles of snow. 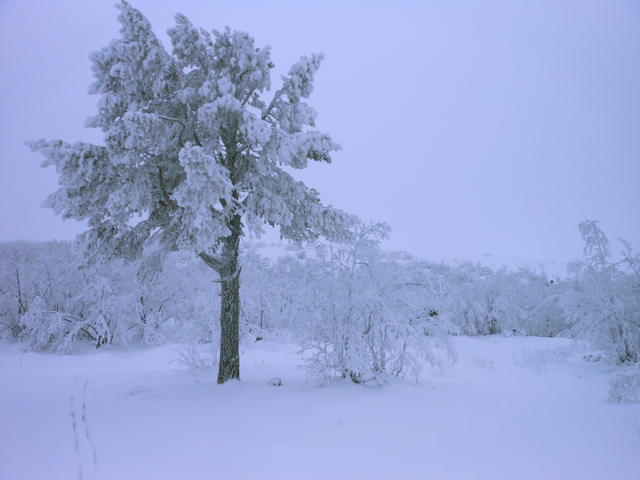 My first day in Kiruna was actually one of the brightest, little did I know at the time. 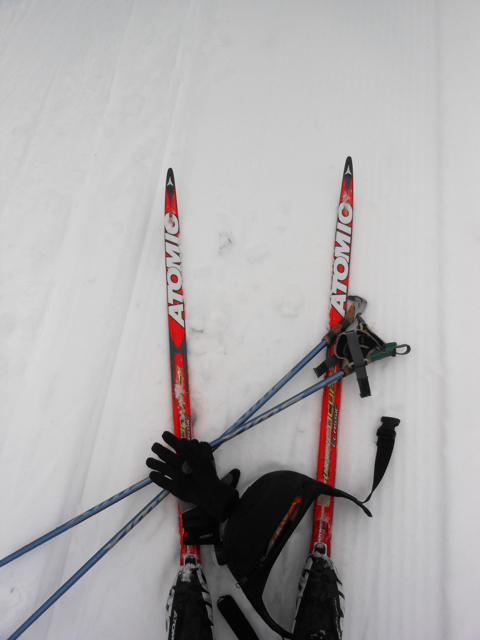 But it certainly contributed to my immediate delight as soon as I clipped into my skis: I was on snow! Skiing! I remember that in past years, the first time on skis was awkward. Coming from rollerskis, the snow is an unfamiliar surface for you to slip and slide on. But this time, it felt completely right. I was onto the tracks and off on an adventure. Sometimes when you don’t do something for a long time, you wonder if you really do love it or whether you’re making up stories in your head. In this case, no stories: I really, really love skiing. There’s a reason, and this is it. One of the first loops I tried was called the Midnattsolstigan, or Midnight Sun trail. Okay, so it was the wrong time of year for the midnight sun, but it was a lovely trail, looping through some old mined-out hills and swooping down into a valley with expansive views of the whole region. As I skied there one day, a snowshoe hare scampered along in front of me, almost impossible to pick out against the white background. 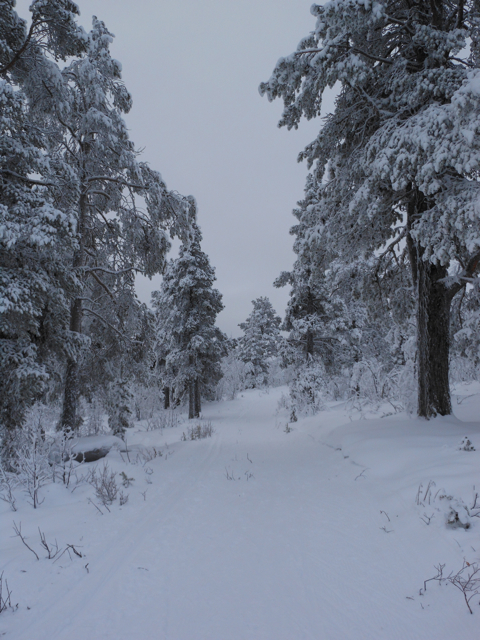 Another long loop was called the Jägerspåret, or Hunter’s Track. It reminded me a little bit of Green Woodlands in the way that it climbed hills, then dropped down to tour around bogs. The seventeen kilometers were in various states of grooming, and I encountered everyone you could imagine from the Swedish skiing public on that trail: people the age of my grandparents in stretched-out lycra and windbreakers, a fourteen-year-old boy skating, a guy my age who strided past with perfect classic technique, middle-aged men and women out for their daily loop. But perhaps the most fun I had was in the evenings. 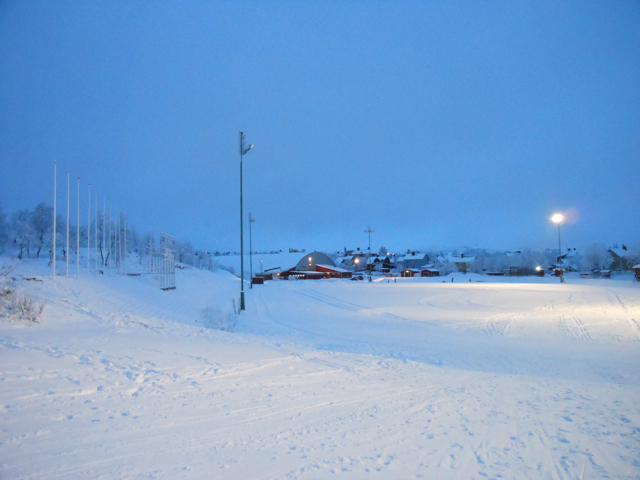 Kiruna used to host World Cup races; Bente Skari, Vincent Vittoz, Kristina Smigun, and Bjørn Dæhlie all won there. 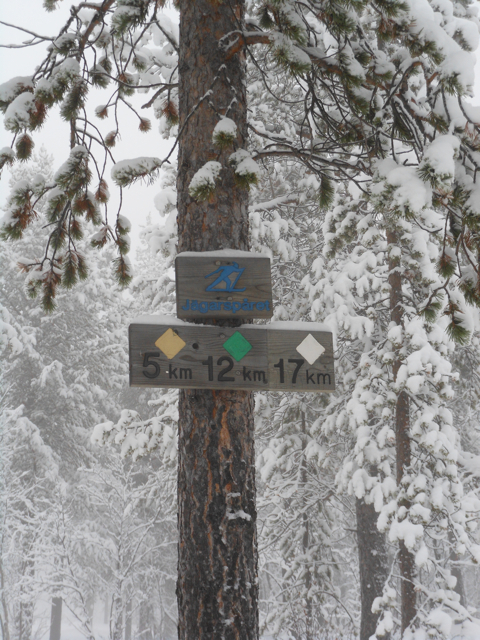 The first kilometer of skiing lulled me into a sense of security: no wonder they don’t race here any more, I thought. This is easy. But then the trails cut down, under a bridge, to the bottom of the hill and climbed back up it, then all the way to the top of the height of land, then dropped down again, swooping around turns and climbing though scrubby conifers. It was harder than I had thought – and it was a lot of fun, to ski on trails where you could really carry speed. And, of course, they were lighted. How else would you ski in Kiruna in the winter? Because the World Cup trails are closest to the city center, whereas the longer loops extend into the hinterland, they are the most easily managed. And to be bombing through the darkness on those hills and twists and turns was even more exhilarating than usual. Those skis were some of the best, the ones where I really remembered: this really is the greatest thing, ever. 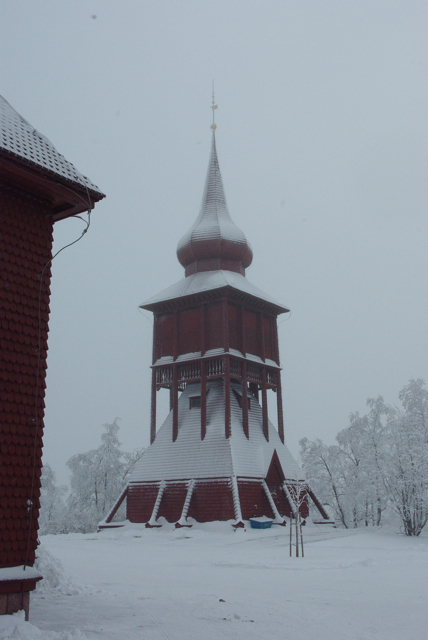 the most beautiful church in Sweden, and how I got there. On Wednesday night, after a day of scrambling around to and from Stockholm and generally being frantic, I climbed onto a train at Uppsala Centralstation and went to sleep. It was a new experience: people don’t take trains so much in the U.S., and almost certainly not for long journeys. They’re just commuting vehicles, if anything at all. But here in Sweden – well, the trains might not be on time, but they go an amazing number of places, and they are pretty nice. In my three-berth sleeping room, we each had a made-up bed with sheets, a pillow, and a blanket; towels to use in the shower; our own sink, mirror, soap, and cartons of drinking water. Exhausted, I chatted with a very nice woman who was headed to her hut outside of Gällivare, where she hoped to skate on the frozen lake. Then, when it reached an acceptable hour, we climbed into our bunks and went to bed. When I woke up, we were flying by snowy fields. We eventually reached Gällivare and were put on a bus (another train had broken down on the tracks and we couldn’t get past it… trains are notoriously late and broken in northern Sweden, particularly in the winter) and I chatted with another nice woman, who was actually from a tiny village just across the border from Muonio, Finland – a place I have been, and that I never expected to meet anyone else who even knew where it was (pardon the horrible grammar, I couldn’t figure out how to fix it and I’m tired!). As we pulled into Kiruna, my anticipation mounted. I had been planning this trip for weeks; what would it look like? All I knew was that it was waaaay far north, relied on iron mining for its economy, and that people from the south wouldn’t want to go there in the winter. We got off the bus and I hoisted my ski bag onto my shoulders and began the walk up the hill to town. My hostel didn’t open for checkin until 2 p.m., so I left my bags there and went for a ski. 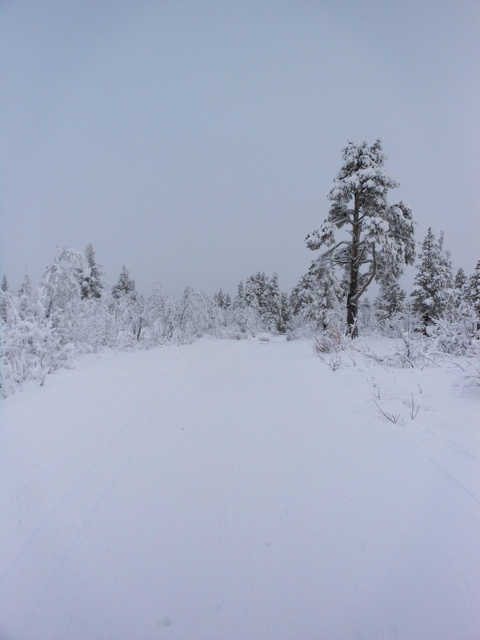 It was a lovely ski, just as everything in Kiruna was lovely. When you think of a remove city sustained my iron excavation, a city that nobody in the country really thinks of, the idea you see is not Kiruna. Kiruna has downtown shopping malls with names like “City Galaxy”, public art, cute coffeeshops, and girls with blonde pixie haircuts who shop at Lindex and H&M. It has a sewing shop that also sells bodybuilding supplements like NOXplode. It has bars styled after England (The Bishops Arms Tavern) and Bavaria. And it has lighted ski trails on a World Cup course, where you might see kids, grandparents, or anyone in between out zooming around on skis – or walking their dog. And, it has the most beautiful building in Sweden. That’s right. 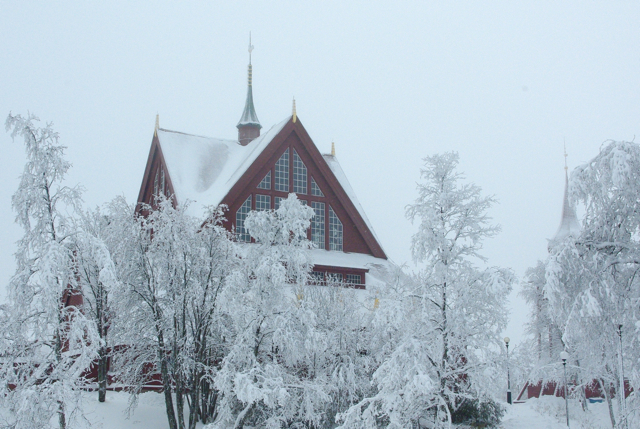 In 2001, Swedes knew enough to vote Kiruna Church the most beautiful public building in the country. 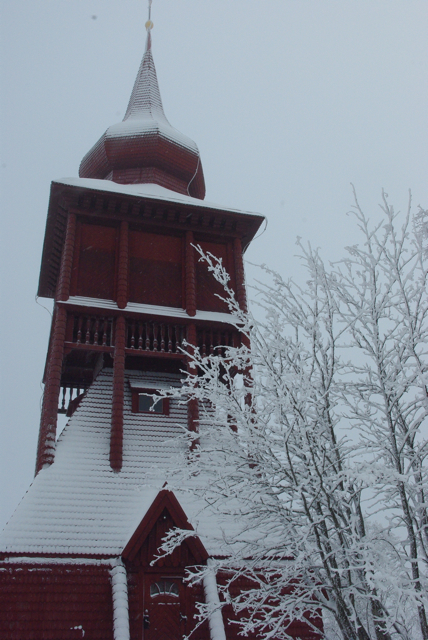 It’s not a usual church: built from 1909 to 1912, it’s made entirely of wood and painted a deep, bright red like only the Scandinavians can paint things. 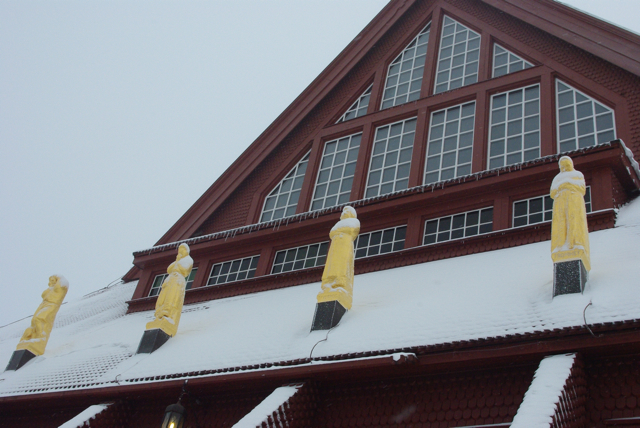 Its expansive gables an buttresses were imagined by architect Gustaf Wickman to imitate a traditional Sami tent. I can imagine how the church would glow under the midnight sun, the light reflecting off the huge triangular flanks of windows. But in the snow, it’s just as beautiful. 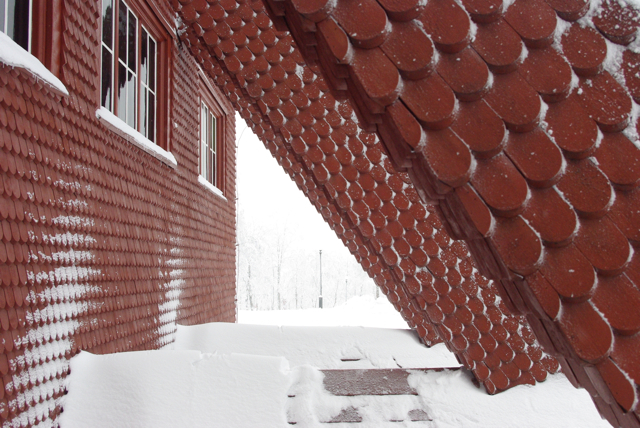 Where else in the world are flying buttresses shingled, serpentlike? And the snow is what we had. Snow and fog: one of the few disappointments of my trip was that I was unable to see the northern lights, because it was cloudy every night. When I woke in the morning, the city would almost always be shrouded in a sort of misty fog: you could see the next house down the street, but any further than that and the features would start to melt to some extent into the whiteness of the sky. Churches are tall, and this one is on a hill, so I expected I would be able to simply pick out its towers and walk towards them. But I couldn’t see; I had to navigate a map and not until I was two blocks away could I see where I was going. 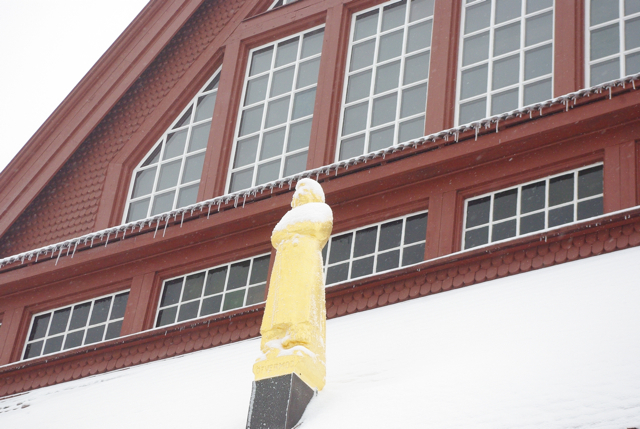 Another seemingly strange feature is that the main building doesn’t have a bell. Instead, there’s a completely separate building which houses the belltower, and that, too, is something you might see poking out of the mist. The top you can imagine sitting on a church – but the bottom is fortified into something you might imagine to store grain over the winter, or stockpile supplies for an inevitable bad harvest. I really have no idea what the history of the structure is, but it’s fascinating to look at. And Wickman took another idea from older cathedrals and changed it to fit the circumstances: carvings of saints or bible scenes which often grace more Gothic buildings. 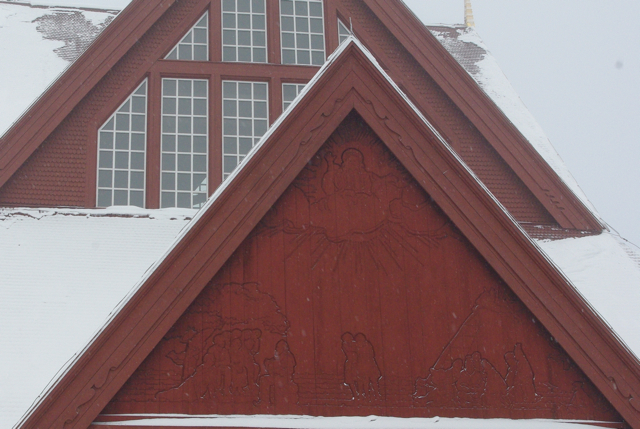 In Kiruna, the face above the door is adorned with traditionally flat etching – no relief, just line drawings upon the wood. Tradition was maintained, though, with a collection of gold-painted figures looking down at paritioners and admirers; they represent ideas like humility, love, and rapture, but also arrogance, melancholy, and despair. 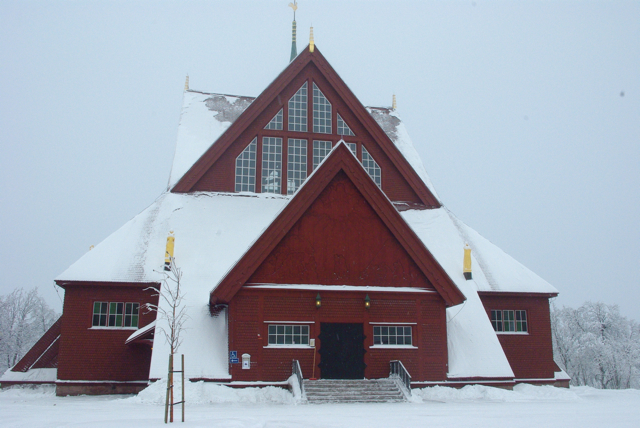 The crazy thing about the Kiruna Church is that it’s going to be torn down. Probably not tomorrow, and probably not next year: but like all of Kiruna, it will be demolished and then rebuilt. That’s because there is a giant vein of iron ore that runs directly underneath the city, and for the city to survive, it has to literally consume itself. Houses, neighborhoods, and the town hall will be relocated, and the church is no exception. Luckily, as one town leader explained, it’s made of wood so it can simply be taken apart and put back together again. That makes me sad. What does it mean for a building of any sort, and a church in particular, to be taken apart? Maybe it’s because my father is a carpenter, and I can imagine some of the beautiful things he has built being torn apart, but I’m afraid that a little bit of the church’s soul will be lost when it’s ripped to the ground. When it is unceremoniously trucked to a yet-to-be-decided location. When it is reduced to its constituent pieces, which in no way add up to the whole. 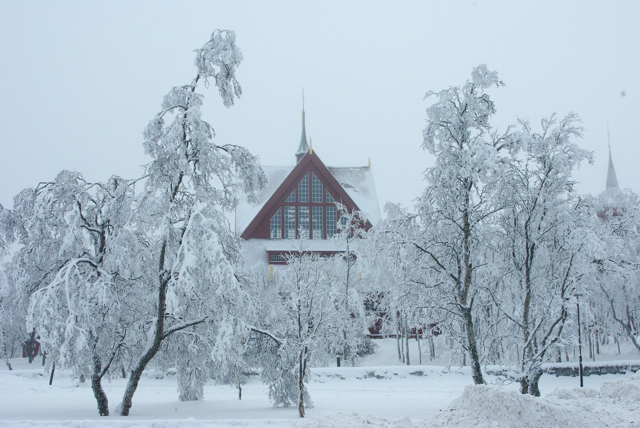 Its current home on the hill, nestled in the trees, seems to me to nurture and protect Kiruna Church. That’s its home. It can’t be dug up. Is that blasphemous? To worry about a church’s soul? Or is it stranger that I, dedicated agnostic (ha, oxymoron), am so worried about the church and its spiritual integrity and resting place? Either way, it’s a beautiful building, and I’m glad I got to see it in the spot Wickman picked for it – where it is perfectly situated to show off the calculus that combines the culture of northern Sweden with awe-inspiring cathedral architecture.